Chop up 3 ounces of your favorite chocolate and gently melt in a double boiler. Add 2 teaspoons hot chocolate mix and 1 1/2 tablespoons sugar and stir to combine. Remove from the heat and slowly stir in 1/2 cup milk until smooth. Let it cool to room temperature. 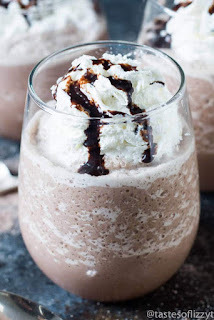 Pour your chocolate mixture into a blender along with 1 cup milk and 3 cups of ice. Blitz on high speed until all mixed up – you want it to be more the icy texture of a frozen daiquiri than a super smooth smoothie. Top the frozen hot chocolate with whipped cream and shaved chocolate curls and find someone to share (or keep it to yourself, we won’t judge).